The historic and charming city is fast becoming a hotbed for some of the best roasts in the country. It’s also one of the quaintest getaways in the South, with beautiful buildings, lots of green space, and plenty of places to refuel. Here are our favorite Savannah coffee shops and cafes to check out next time you’re in town. This store is filled to the brim with oddities and treasures, but it’s their iced coffee that has us coming back for more. They also have the tastiest macarons and lavender cookies that would make a Parisian proud. Grab a cold brew at the cafe, then browse the shop to find special items, like books, cashmere throws, and furniture. One of Savannah’s most beloved coffee spots, this former home has been converted into a cafe serving horchata lattes, cocktails, and tacos. The lounge areas quickly fill up when Foxy Loxy hosts live music nights every Tuesday, and artist receptions kick off the first Friday of every month. One of the most vibrant areas of the city is the historic Savannah College of Art and Design (or SCAD, as it’s known). Check out the campus, then refuel at Art’s. The classic double-decker bus that holds court in the space was originally used in London (and then at SCAD for student transportation). Now you can grab coffee and inside the bus and even work on the top decker. When the temperatures rise in Savannah, seek some solace with a mason jar of cold brew. This cafe is the sister spot to Foxy Loxy Cafe, albeit a bit smaller and cozier. It’s south of Forsyth Park and is perfect for grabbing a table or rocking chair while enjoying the weather on the–enclosed!–patio. Come for the organic yerba mate, stay for the sweet rolls. Pick a booth by the window and enjoy watching the hubbub along Habersham. If you’re too full to try the banana bread, we recommend taking a loaf to go. Not only does this vegetarian restaurant serve up a mean cup of fair-trade joe, but it’s also a great place to hang out at night, when Savannah’s most talented performers take part in open-mic events. 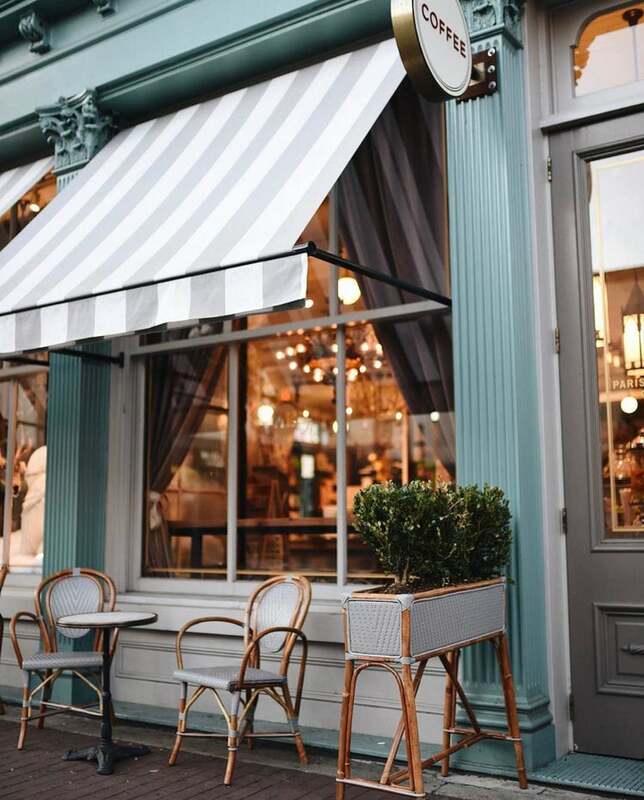 Although Collins Quarter is on many a must-try list for dining out in Savannah, their coffee window is the best-kept secret for ordering a gourmet cup to-go. Pick up a flat white and stroll along the river. If you’ve got time to hang out for a while later in the day, the cocktail menu is worth a peruse. This story was orginally published in January 2017, and has since been updated with new information.